Updated 1/28/18: Thank you for all the help! Time to move on to The Big List™. 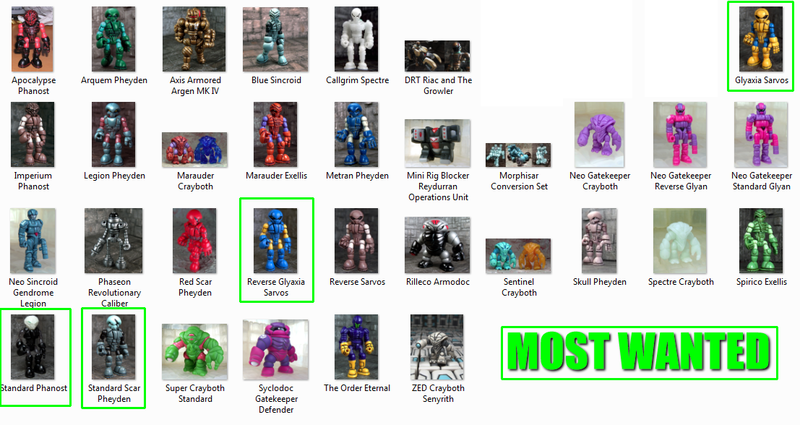 This is literally me going through archive sections on Glyos sites and seeing anything I'd like and putting it together, kept in image format for anyone who can't recall the names. I'm not in a position to buy yet, but come the 1st I'll be eager to add some new things to the collection. If you can help out it would be much appreciated. - Enough parts for a Phase Defender, preferably in Gatekeeper or Ecroyex. Post updated with The Big List and status of the Apocalypse hunt! Wanted list updated with the newest finds taken off. Once again not a lot of free cash to spend but for the right find I could stretch the budget, so feel free to contact.